She embodies Alliance core values and a deep commitment to helping every scholar reach his or her potential. 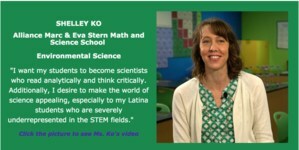 Deeply passionate about breaking down stereotypes of who can be a scientist, Ms. Ko inspires the young men and women in her class to pursue careers in STEM fields, where only 2% of the workforce is Latino. We invite you to also be inspired. Enjoy this video in our celebration of the transformative work of our dedicated educators.